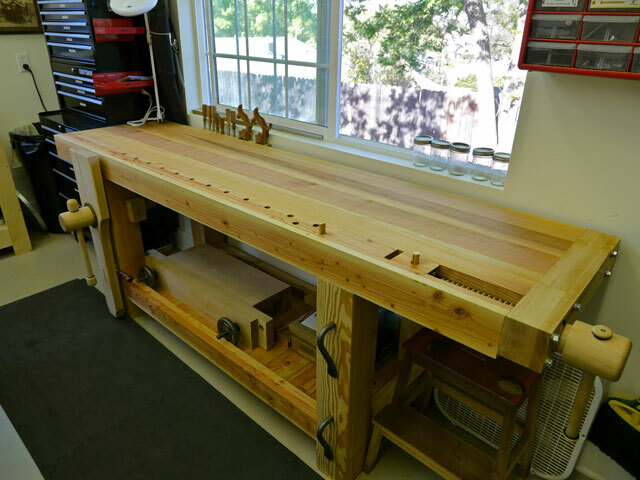 Adding our September 2013 Workbench of the Month from Michael C. of Los Angeles, California to our Lake Erie Toolworks Blog for ease of access and historical awareness. Hi – My name is Michael C. and I’m a musician and beginning woodworker from Los Angeles, CA. 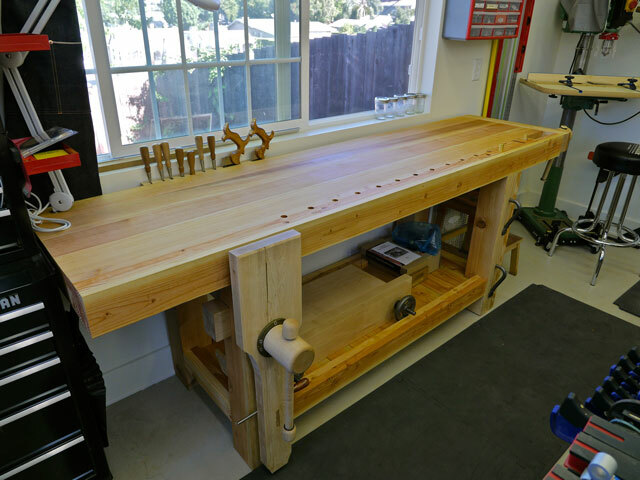 I’ve just completed my French Roubo workbench with both the Lake Erie Leg Vise and Wagon Vise. After researching methods of workholding and evaluating my own needs, I decided to go with a Wagon Vise for securing boards for hand planing. The aesthetics of the Lake Erie kits worked perfectly with the design of this bench and I am very happy with how they turned out. Functionally, the vises operate beautifully and I’m excited to really start putting them through their paces. As far as the bench construction, I used 6×6 Douglas Fir Timbers to create the top and legs, and dimensional 2×6 Douglas Fir lumber was used to create the aprons. Hard maple was used for the vise chop, wagon vise endcap, parallel guide and chisel/saw rack. The benchtop was preliminarily flattened using a series of handplanes, but after the initial lamination glue-up there was some moderate twist that needed to be addressed. I constructed a router sled on rails and used this to re-flatten the top which worked out far better than I had imagined (and took far less work!). I finished the bench with a few coats of a boiled linseed oil/varnish/mineral spirits mixture. 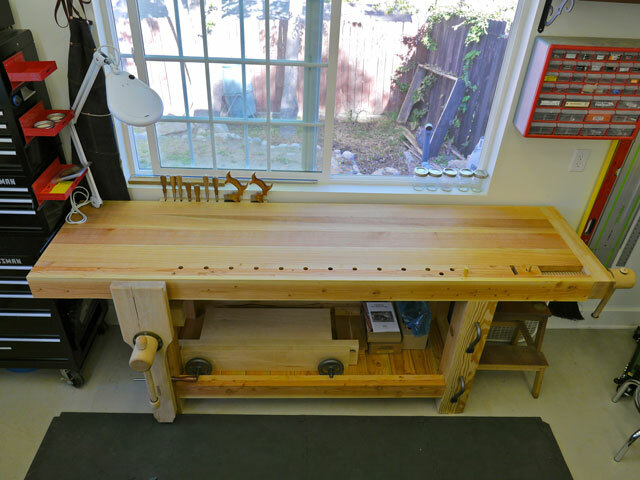 As my first real hand-tool woodworking project, I learned a ton about different processes, techniques, and methods of troubleshooting while constructing this bench. I look forward to continuing my woodworking journey with it.